Make decorating your home easy this Christmas with these festive wooden Christmas table decorations. 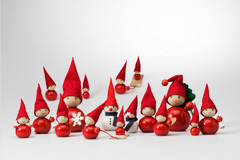 Bright, red and festive, Lumitonttu is just one of the collectable tonttu ornaments you can now buy online. 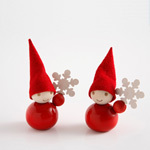 This special Christmas decoration is made by dedicated craftsmen in Santa's homeland. Made from sustainable wood, Lumitonttu makes a high quality, eco-friendly and durable wooden Christmas table decoration that you can easily add to your Christmas dec collection. Lumitonttu, like all his tonttu friends, offers a quick and easy way of adding festive charm to your home or office at Christmas. He perfectly complements a traditional Yuletide theme or adds a touch of red to other colour schemes. Simply pop one of these special wooden Christmas table decorations on your table, mantelpiece or shelf to add instant seasonal cheer. For more impact, group different sized tonttus together. Looking for inspiration to decorate your dining table? These special wooden Christmas ornaments are perfect for propping up name cards or completing a seasonal centrepiece. You can choose several of one design, or for a more personal touch, select a different tonttu to represent each guest, friend or family member.